According to the U.S. National Highway Traffic Safety Administration (NHTSA), in 2006, 13.10 cars out of 100,000 ended up in fatal crashes. The rate for motorcycles is 72.34 per 100,000 registered motorcycles. Motorcycles also have a higher fatality rate per unit of distance travelled when compared with automobiles. Per vehicle mile traveled, motorcyclists' risk of a fatal crash is 35 times greater than a passenger car. In 2004, figures from the UK Department for Transport indicated that motorcycles have 16 times the rate of serious injuries compared to cars. Motorcycle riders aged below 40 are 36 times more likely to be killed than other vehicle operators of the same age. Motorcycle riders aged 40 years and over are around 20 times more likely to be killed than other drivers of that same age. According to 2005 data from the NHTSA, 4,008 motorcycle riders were killed on United States roads in 2004, an 8% increase from 2003. During that same period, drivers of automobiles showed a 10% increase in fatalities, while cyclists showed an 8% increase in fatalities. Pedestrians also showed a 10% increase in fatalities. A total of 37,304 automobile occupants were killed on U.S. roads in 2004. Additional data from the United States reveals that there are over four million motorcycles registered in the United States. Motorcycle fatalities represent approximately five percent of all highway fatalities each year, yet motorcycles represent just two percent of all registered vehicles in the United States. One of the main reasons motorcyclists are killed in crashes is because the motorcycle itself provides virtually no protection in a crash. For example, approximately 80 percent of reported motorcycle crashes result in injury or death; a comparable figure for automobiles is about 20 percent. Two major scientific research studies into the causes of motorcycle accidents have been conducted in North America and Europe: the Hurt Report and the MAIDS report. A major work done on this subject in the USA is the Hurt Report, published in 1981 with data collected in Los Angeles and the surrounding rural areas. There have been longstanding calls for a new safety study in the US, and Congress has provided the seed money for such a project, but as yet the remainder of the funding has not all been pledged. The Hurt Report concluded with a list of 55 findings, as well as several major recommendations for law enforcement and legislation. 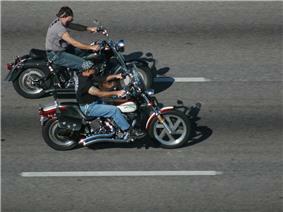 Among these, 75% of motorcycle accidents involved collision with another vehicle, usually a car. In the MAIDS report, the figure is 60%. In the single vehicle accidents, motorcycle rider error was present as the accident precipitating factor in about two-thirds of the cases, with the typical error being a slide-out and fall due to overbraking or running wide on a curve due to excess speed or under-cornering. The failure of motorists to detect and recognize motorcycles in traffic is the predominating cause of motorcycle accidents... Conspicuity of the motorcycle is a critical factor in the multiple vehicle accidents, and accident involvement is significantly reduced by the use of motorcycle headlamps-on In daylight and the wearing of high visibility yellow, orange or bright red jackets. The most recent large-scale study of motorcycle accidents is the MAIDS report carried out in five European countries in 1999 to 2000, using the rigorous OECD standards, including a statistically significant sample size of over 900 crash incidents and over 900 control cases. The MAIDS report tends to support most of the Hurt Report findings, for example that "69% of the OV [other vehicle] drivers attempted no collision avoidance manoeuvre," suggesting they did not see the motorcycle. And further that, "the largest number of PTW [powered two-wheeler] accidents is due to a perception failure on the part of the OV driver or the PTW rider." And "The data indicates that in 68.7% of all cases, the helmet was capable of preventing or reducing the head injury sustained by the rider (i.e., 33.2% + 35.5%). In 3.6% of all cases, the helmet was found to have no effect upon head injury" and "There were no reported cases in which the helmet was identified as the contact code for a serious or maximum neck injury." A New Zealand study using data taken between 1993-96 in the city of Auckland, a "predominantly urban area" (Wells et al. ) supported the Hurt Report's call for increased rider conspicuity, claiming that riders wearing white or light colored helmets, fluorescent or reflective clothing or using daytime headlights were under-represented when compared to a group of motorcycle accident victims. The accident victims were those who were killed, or admitted or treated at hospital "with an injury severity score >5 within 24 hours of a motorcycle crash". Accidents that did not result in hospitalization or treatment for a critical injury, or a death were not considered, nor was there any consideration of involvement of other road users, or culpability. The definition of reflective or fluorescent clothing was taken to include "clothing or other articles such as a jacket, vest, apron, sash, ankle or wrist band, or back pack including stripes, decals or strips". No assessment of the type (open or full-face) of helmet was undertaken. Most of the crashes took place in "urban 50 km/h (31 mph) speed limit zones (66%), during the day (64%) and in fine weather (72%)". No association was observed between risk of crash related injury and the frontal colour of the drivers' (sic) clothing or motorcycle. The MAIDS report did not publish information on helmet color or the prevalence of reflective or fluorescent clothing in either the accident or control groups, or the use of lights in the control group, and therefore drew no statistical conclusions on their effectiveness, neither confirming nor refuting the claims of the Wells report. In each MAIDS case, the clothing worn by the rider was photographed and evaluated. MAIDS found that motorcycles painted white were actually over-represented in the accident sample compared to the exposure data. On clothing, MAIDS used a "purely subjective" determination of if and how the clothing worn probably affected conspicuity in the accident. The report concluded that "in 65.3% of all cases, the clothing made no contribution to the conspicuity of the rider or the PTW [powered two-wheeler, i.e. motorcycle]. There were very few cases found in which the bright clothing of the PTW rider enhanced the PTW’s overall conspicuity (46 cases). There were more cases in which the use of dark clothing decreased the conspicuity of the rider and the PTW (120 cases)." MAIDs concluded that in one case dark clothing actually increased conspicuity but reported none where bright clothing decreased it. Some riders take few steps to mitigate the risks of motorcycling. Transportation historian Jeremy Packer has suggested four categories to describe the different approaches to the risks of motorcycling. The first and fourth categories take opposite views of motorcycling, but share a fatalistic notion that to motorcycle is to tempt fate. The second and third categories differ in the degree of emphasis they place on measures to limit the risk of riding, but share the view that riders have some degree of control and are not victims of fate. Quit riding. Or ban motorcycling; this is the belief that motorcycling is too dangerous. Some former motorcyclists had an epiphany due to an accident involving themselves or a person they know, which permanently upends their view of motorcycling. Some are adamant in their opposition to motorcycling, unwilling to consider the merits or pleasures of riding due to their horror at the danger and physical carnage of motorcycle accidents. Agony aunt Claire Rayner, in her review of Melissa Holbrook Pierson's motorcycling book The Perfect Vehicle, admits her prejudice that nothing Pierson writes could change her attitude about motorcycling because, "I used to be hospital casualty nurse and spent so much time dealing with bikers who were scraped off the road like so much raspberry jam after accidents that I became an implacable hater of the machine... The danger to which bikers constantly put themselves, however well-wrapped in their urban armour of studded leather, and however horrendously helmeted, seems to me a reason for banning the infernal machines. ...a smell of blood and smashed muscle and bone mixed with engine oil. That is what motor cycle means to me. And, I'm afraid, always will." Some safety experts have advocated banning motorcycling altogether as being untenably dangerous. Hyperreflective self-disciplinary. This attitude to risk consists of self-criticism, constant vigilance, perpetual training and practice, and continual upgrading of safety equipment. It is sometimes a reaction to an epiphany. There are many examples of riding advice which enumerate strategies for avoiding danger while riding, but they de-emphasize the rider accepting inherent risk as part of riding, instead emphasizing the rider's agency, based on his education and practice, in determining whether he will crash or not, and the utility of the correct safety gear in whether or not he will be injured in a crash. David Edwards of Cycle World wrote, "Here's the thing: motorcycles are not dangerous," saying that if a rider has a license, attends riding schools, wears all the gear all the time (ATGATT), and develops an accident avoidance sixth sense, motorcycling can become safe; "... do all of these things, become really serious about your roadcraft, and you'll be so under-represented in accident statistics as to become almost bulletproof." Kevin Cameron, also in Cycle World wrote, "[J]udgment improves with use. The longer you ride, the safer your operation tends to become. You learn to control your vehicle in a wider variety of situations, and you learn the value of playing three moves ahead of the four-wheeled traffic around you—as you must. In the process, you become a better automobile driver as well as a more skilled motorcyclist.". An Oregon reporter interviewed professional riding instructors and highly trained motorcycle officers about their risk reduction strategy and found that "they constantly tweaked their habits to stay sharp. Many never ride with groups, which they consider a distraction. They stay home on holidays and wear the most reflective gear, not black. And increasingly they talk about driving impaired – not by drugs and alcohol – but by fatigue and exposure." Risk Valorization. This is the acceptance that risk is unavoidable but can be embraced by making certain choices, whereby motorcyclists, "reappropriate risk and motorcycling as something which can't be measured only according to utility and efficiency... This discourse doesn't eschew safety in absolute terms, but neither does it maintain the validity of safety as the be-all and end-all for riding." Motorcycling advocate and writer Wendy Moon said that one of the reasons she relaxed her insistence on always wearing a helmet while riding was that she no longer considered it worth "the mental effort required to maintain that protective attitude. I am not free to live in the now because I’m enslaved to the future 'what if.' ...So we gradually distance ourselves from experiencing a full and free life and we don’t even know it. As a society, we’re like kids so bundled up against the snow we cannot move at all.... Embracing that risk rejuvenates the soul and empowers one to live the rest of her life as she wants." Flaunting risk. Hunter S. Thompson's passages in his book Hell's Angels have been quoted by Packer and others as perhaps the best illustrations of the devil-may-care approach of a sizable group of motorcyclists: "They shun even the minimum safety measures that most cyclists take for granted. You will never see a Hell's Angel wearing a crash helmet. Nor do they wear Brando-Dylan-style 'silver-studded phantom' leather jackets," and "anything safe, they want no part of", and "The Angels don't want anybody to think they're hedging their bets." In his essay Song of the Sausage Creature, Thompson wrote, "It is an atavistic mentality, a peculiar mix of low style, high speed, pure dumbness, and overweening commitment to the Cafe Life and all its dangerous pleasures." Packer calls it, "a fate driven sensibility." Packer is a Michel Foucault-inspired historian who sees the approach to motorcycle safety found in mainstream sport and touring motorcycling media, supported by the MSF, and generally consistent with the advice of transport agencies, such as the US National Agenda for Motorcycle Safety, as an ideology or "discourse", and places it as only one among multiple ideologies one may hold about motorcycling risk. While giving respect to the first two discourses, Packer himself is sympathetic to the third approach and disdainful of the fourth. Packer's analysis of the second category, hyperreflective self-disciplinary, acknowledges that seriousness, sobriety, ongoing training, and wearing complete safety gear is not misguided, but also has concerns over its close alignment with the profit motives of the insurance industry, the motorcycle safety gear advertisers, and the public relations desires of motorcycle manufacturers, as well as governmental bureaucratic inertia and mission creep. He sees motorcyclists who make non-utilitarian choices balancing risk and reward as being as respectable as other categories. BMW psychologist and researcher Bernt Spiegel has found that non-motorcyclists and novice motorcyclists usually share the fatalistic attitude described by Thompson, insofar as they think that high speed motorcycling is like a game of chicken or Russian roulette, where the rider tests his courage to see how close he can come to "the edge", or specifically the limit of traction while braking or cornering, without having any idea how close he is to exceeding that limit and crashing. In Thompson's words in Hell's Angels it is, "The Edge... There is no honest way to explain it because the only people who really know where it is are the ones who have gone over. The others — the living — are those who pushed their luck as far as they felt they could handle it, and then pulled back, or slowed down, or did whatever they had to when it came time to choose between Now and Later." Spiegel disagrees that only those who have "gone over", that is, crashed or died, know the location of the boundary line. He says that if motorcycle racers, or even non-professional advanced riders who ride modern sport bikes near their performance limits, were approaching the limits of traction blindly, they would be like a group of blind men wandering around the top of a building, and most of them would wander off the edge and fall. In fact, Spiegel says, crashes among skilled high speed riders are so infrequent that it must be the case that they can feel where the limit of traction is as they approach the limit, before they lose traction. Spiegel's physiological and psychological experiments helped explore how it is possible for a good rider to extend his perception beyond the controls of his motorcycle out to the interface between the contact patches of his motorcycle and the road surface. Those subscribing to the first and fourth of Packer's risk categories are likely to believe no rider can sense when they are near the traction limit, while the second and third risk categories include those who share Spiegel's view that a rider need not lose traction and start to skid to know where the limit is. Motorcycle Consumer News Proficient Motorcycling columnist Ken Condon put it that, "The best riders are able to measure traction with a good amount of accuracy" even though that amount changes depending on the motorcycle, the tires and the tires' condition, and the varying qualities of the road surface. But Condon says the rider feels the limit of traction through his hand and foot interface with the handelbars and footpegs, and the seat, rather than extending his perception out to the contact patch itself. In 2007, a report by the Insurance Institute for Highway Safety (IIHS) claimed that "supersport" motorcycles were four times more likely to be involved in highway crashes than other types. When reprinting this press release as a news report, USA Today omitted the word "insurance" from the "Insurance Institute for Highway Safety", giving a false impression the IIHS is a governmental agency, not a private corporation with a conflict of interest. According to the American Motorcyclist Association (AMA), the IIHS report was an attempt to either ban entire categories of motorcycles, or a covert attempt to support legislative requirements for speed governors in all vehicles. The IIHS report was not a new study, being an analysis of existing data from the national Fatal Accident Reporting System. The methodology consisted of a comparison of fatalities for different styles of motorcycles based on a rate per 10,000 registrations. The report did not incorporate key factors, such as the number of miles the bike was ridden, the traffic environment in which it was used, along with the age and experience of the rider, among others. In an attempt to sort through this confusion, the AMA requested a copy of the classification system the IIHS used in its analysis and found several significant anomalies. For instance, although the IIHS report focused on speed and acceleration as the factors that make its "supersport" category so dangerous, the two most powerful motorcycles that were available at the time in the United States, the Kawasaki ZX-14 and Suzuki Hayabusa, are placed in the Sport category, which are rated considerably less dangerous. And they share that category with the Honda ST1300 and Yamaha FJR1300, two sport-touring bikes. The AMA thought the timing of the IIHS report was unusual. The National Transportation Safety Board specifically asked the Federal Highway Administration to work with states to develop uniform data-collection procedures that will result in better information about the number of miles traveled by motorcycles, one of the most important factors in evaluating crash statistics. As a result, this could be one of the final reports to use registration data exclusively, which is less accurate in reflecting actual motorcycle use. This new IIHS report is remarkably similar to a study the group financed twenty years ago that also purported to show higher fatality rates among sportbikes. At that time, the IIHS used its study as the springboard for a well-orchestrated campaign that included ready-made news footage it fed to TV news operations across the country. That campaign culminated in the introduction of a bill in the U.S. Senate to impose a horsepower limit on all motorcycles sold in the U.S. In response to that previous attempt by the IIHS to ban sportbikes, the AMA conducted an analysis of the study and raised questions that the Association submitted to Harry Hurt, lead researcher on the most comprehensive study of motorcycle crashes ever conducted. Hurt reviewed the research and declared it "fatally flawed" for exactly the kind of methodology problems seen in the new IIHS report. The Association then coordinated a campaign among motorcyclists across the country that eventually led the senator to withdraw his proposed legislation. The new IIHS report came out just as the AMA and the motorcycling community was successful in getting federal funding for the first comprehensive motorcycle safety study since the Hurt Report. Data from the Iraq War era showed that United States military veterans returning from Southwest Asia combat areas were dying in motorcycle related fatalities. Between October 2007 and October 2008, 24 active-duty Marines died from motorcycle accidents. There were 4,810 deaths on motorcycles in the U.S. in 2006, an increase of 5 percent over the previous year, and more than double (2,161) over the decade before, according to the National Highway Traffic Safety Administration (NHTSA). In the Marine Corps, high-speed bikes accounted for the majority of fatalities. In 2007, 78 percent of motorcycle mishaps in the Marines occurred on a sport bike, compared to 38 percent nationally. In a chapter of Coming and Going on Bikes, Iraq War veteran and author Jack Lewis observed combat veterans' disordered perception of risk, resulting in nearly suicidal behavior: "We already walked through the world's worst neighborhoods with bullseyes painted on our chests... the most at-risk riders in the military community are risk-tolerant, adrenaline-juicing combat professionals." A motorcyclist unbuckles his chin strap in order to remove his helmet after sustaining a minor hand injury through losing control on a wet corner. Collision with less forgiving protective barriers or roadside "furniture" (lampposts, signs, fences, etc...). Note that when one falls off a motorcycle in the middle of a curve, lamps and signs become impossible to negotiate around. Concussion and brain damage, as the head violently contacts other vehicles or objects. Riders wearing an approved helmet reduce the risk of death by 37 percent. Breakage of joints (elbows, shoulders, hips, knees and wrists), fingers, spine and neck, for the same reason. The most common breakages are the shoulder and the pelvis. Soft tissue (skin and muscle) damage (road rash) as the body slides across the surface. This can be prevented entirely with the proper use of motorcycle-specific protective apparel such as a leather jacket or reinforced denim and textile pants. There is also a condition known as biker's arm, where the nerves in the upper arm are damaged during the fall, causing a permanent paralysis of arm movement. Facial disfigurement, if in the absence of a full-face helmet, the unprotected face slides across the ground or smashes into an object. Thirty-five percent of all crashes show major impact on the chin-bar area. The Hurt Report also commented on injuries after an accident stating that the likelihood of injury is extremely high in these motorcycle accidents - 98% of the multiple vehicle collisions and 96% of the single vehicle accidents resulted in some kind of injury to the motorcycle rider; 45% resulted in more than a minor injury. A motorcyclist wearing helmet, gloves, boots, and armored, reflective textile jacket and pants. To address the risks of motorcycling, before and after a fall, motorcyclists use personal protective equipment (PPE, or more commonly "motorcycle gear"). Many developed countries now require certain articles of PPE, and manufacturers and governments recommend its extensive use. Improved visibility — Although for decades the popular image of the motorcycle rider has been of someone clad head-to-toe in black leather, in the light of the Hurt Report findings, and the day-to-day experiences of motorcyclists themselves, many riders choose higher-visibility gear. Bright colors and retroreflective strips are common on quality equipment. Abrasion resistance — Thick, tough leather provides the most abrasion resistance in a crash, but fabrics such as Cordura, Kevlar and ballistic nylon provide significant protection too. In addition, fabrics are generally cheaper, easier to maintain, waterproof, and more comfortable in hot weather. Thick leather, which affords the most abrasion resistance, can be uncomfortable in temperatures exceeding 29 °C (85 °F) and above 38 °C (100 °F) may cause heat stress & loss of control with insufficient fluid replacement. Some PPE may be constructed of fabrics made into a 'mesh' that provides cooling and a stable surface for the attachment of padding (see below). Impact protection — Quality jackets and pants provide significant extra padding in the vulnerable joint regions described above. This can take the form of simple foam padding, or dual-density foam that stiffens when compressed, sometimes with plastic or carbon fiber outer-shells that distribute the impact across the pad. Integrated pieces can be found in some jackets. Another way to reduce impact is by wearing airbag protection. Weather protection — One important aspect of PPE not mentioned above is protection from the elements. Extreme weather can make a long ride unbearable or dangerous. PPE provides protection from wind, rain and cold. A full-face helmet credited for saving its user. Half helmets or "skid lids" meet minimum legal requirements. 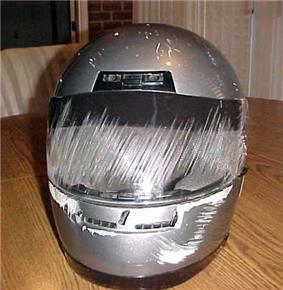 Helmet — A full-face helmet provides the most protection. Thirty-five percent of all crashes show major impact on the chin-bar area. However, 3/4- and 1/2-helmets also are available. Some motorcycle training sites have banned the use of half-helmets because of avoidable injuries sustained by riders wearing them. Gloves — Commonly made of leather, cordura, or Kevlar, or some combination. Some include carbon fiber knuckle protection or other forms of rigid padding. Gloves designed specifically for motorcycle use have slightly curved fingers and the seams are on the outer surfaces to allow the motorcyclist to maintain his grip and control on the handlebars and clutch/brake levers. Some gloves also provide protection to the wrist. Jackets — Generally made from leather, ballistic nylon, cordura, Kevlar or other synthetics. Most jackets include special padding on elbows, spine and shoulders. Competition-approved hard armor is superior to soft padding. Competition-approved back and chest protectors can be worn underneath jackets. Inflatable airbag jackets can offer an additional airbag for neck support. Pants — Made of the same material as jackets, usually including special protection for the knees and hips. Boots — Especially those for sport riding, include reinforcement and plastic caps on the ankles, and toe area. Boots designed for cruiser-style riders often have steel-reinforced toes (however this reduces sensitivity of the foot when changing gear). Boots should always have a rubber sole (as opposed to leather or other less flexible materials). Despite their toughness and protection, most boots are very lightweight. Some even include titanium plating. Goggles or helmet visor — Eye protection is of utmost importance - an insect or a kicked-up pebble in the eye at speed has enough momentum to cause significant damage. Such an event could easily cause the rider to lose control and crash. Besides this danger, squinting into the wind is unpleasant at best and watering eyes are quite distracting. Earplugs — Most riders experience substantial wind noise at speeds above 64 to 80 km/h (40 to 50 mph). Earplugs help protect against hearing damage, and reduce fatigue during long rides. Vests — Made with high-visibility colors and retroreflective materials, vests can be worn over jackets to increase the chance of being seen and allow drivers to better judge the speed and position of riders, especially in adverse conditions of dark and wet. Airbags – worn in jackets and vests can offer riders a neck brace and spine protection, as well as abdomen, chest, ribs, and hip/pelvic protection. Other PPE — Dirt bike riders wear a range of plastic armor to protect against injury from falling and hitting other riders and bikes, running into track barriers, and being hit by flying debris kicked up by the tires of other riders' bikes. This type of armor typically covers the back, chest, and sometimes the extremities. It is increasingly common for gloves, jackets, pants, and boots to be outfitted with hard plastics on probable contact areas in an effort to ensure that when a motorcyclist contacts the ground, his clothing will permit him to slide relatively easily as opposed to "crumpling", risking injury to body parts being stressed in abnormal directions. Riders sometimes use the acronyms MOTGMOTT and ATGATT, which stand for "Most Of The Gear Most Of The Time" and "All The Gear All The Time", when describing their personal gear preferences. In many developed countries riders are now either required or encouraged to attend safety classes in order to obtain a separate motorcycle driving license. Training can help to bridge the gap between a novice and experienced rider as well as improving the skills of a more experienced rider. Skills training would seem to be the answer to reducing the KSI ("killed or seriously injured") rate among motorcycle riders. However, research shows that some who undergo advanced skills training are more likely to be at a higher risk while using the roads (Rutter & Quine, 1996). This risk compensation effect was commented on in the findings of the evaluation of the “Bikesafe Scotland” scheme, where a number of those who undertook training said they rode faster in non-built-up areas after the course (Ormston et al., 2003). This is not to say that training in not important, but that more advanced training should be tempered with psychological training (Broughton 2005). A literature review found that driver and rider education had little benefit, due to the failure of most programs to account for the age and inexperience of the highest risk drivers. After reviewing motorcycle rider education/training programs in three countries, Dan Mayhew of Canada's Traffic Injury Research Foundation said, "no compelling evidence that rider training is associated with reductions in collisions." Bayly, M., Regan, M., & Hosking, S. (2006). Intelligent transport systems and motorcycle safety. [Report No. 260]. Melbourne, Australia: Monash University, Accident Research Centre. Berg, F. A., & Rucker, P. (2002). Airbag prototype for a mid-sized touring motorcycle. International Research Council on Biomechanics of Injury Conference. Stuttgart, Germany: DEKRA Automobil. Blanchard, H. T., & Tabloski, P. A. (2006). 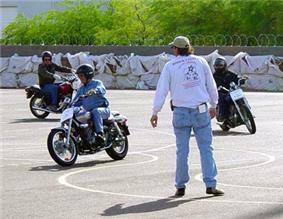 Motorcycle safety: Educating riders at the teachable moment. Journal of Emergency Nursing, 32(4), 330-332. Broughton, P.S. and Walker, L. (2009), Motorcycling and Leisure: Understanding the Recreational PTW Rider: Ashgate Publishing: Aldershot. Elliott, M. A., Baughan, C. J., Broughton, J., Chinn, B., Grayson, G. B., Knowles, J., et al. (2003). 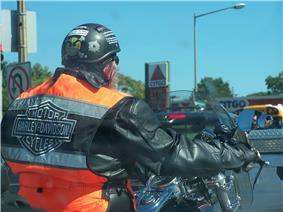 Motorcycle safety: A scoping study. [Report No. TRL581]. Transport Research Laboratory. Huang, B., & Preston, J. (2004). A literature review on motorcycle collisions: Final report. Oxford University, Transport Studies Unit. Pierce, A. (2002). The personal airbag. Tech Directions, 61(7), 10. "Casualty rates: by road user type and severity: 1994 to 2004" (PDF). Department of Transport, UK. "In-Depth Study of Motorcycle Accidents". Department of Transport, UK. November 2004. 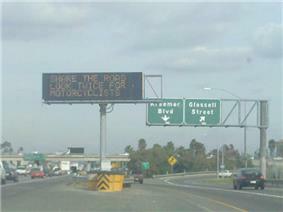 ^ "Motorcyclists - Crashes". Australian Transport Safety Bureau (ATS). ^ "Motorcycle Helmets Fact Sheet". Advocates for Highway and Auto Safety. Retrieved 2007-06-26. ^ Carpenter, Susan (2009-03-01). "U.S. motorcycle crash study stalls: MAIDS 2.0 may have to suffice". Los Angeles Times Blogs. The long-awaited follow-up to the 1981 Hurt Study is short at least $2 million, and it's unclear whether that funding will come through any time soon. Or ever. ^ "Main findings of the MAIDS report on accident characteristics". Maids – In-Depth Investigation of Motorcycle Accidents. The Association of European Motorcycle Manufacturers (ACEM). 2009. ^ "Table 5.5: Predominating PTW colour". MAIDS (Motorcycle Accidents In Depth Study) Final Report 2.0. ACEM, the European Association of Motorcycle Manufacturers. April 2009. p. 47. ^ "MAIDS (Motorcycle Accidents In Depth Study) Final Report 2.0". ACEM, the European Association of Motorcycle Manufacturers. April 2009. p. 100. ^ Compare: Valorisation, from Marxist theory. ^ a b c d e "Conclusions Misleading In New IIHS Report, AMA Says". American Motorcyclist Association. 2007-09-13. Retrieved 2009-03-10. ^ (2008)"Ability Magazine: Motorcycle Vets - Speeding Into the Danger Zone"". Retrieved 2012-04-05. ^ Jack Lewis (2010). "What Kills Us: Calling in the Nine-Line". Coming and Going on Bikes: Essaying the Motorcycle. Litsam Inc. (Kindle edition). ^ Wald, Matthew (12 September 2007). "Rise in Motorcycle Deaths Renews Helmet Law Debate". ^ a b Otte, Dietmar. "COST 327 Motorcycle Safety Helmets". COST Transport Secretariat. Retrieved 5 April 2010. ^ a b c Dr. Hugh H. Hurt, PhD. (January 1981 (Final Report)). "Motorcycle Accident Cause Factors and Identification of Countermeasures, Volume 1: Technical Report, Hurt, H.H., Ouellet, J.V. and Thom, D.R., Traffic Safety Center, University of Southern California, Los Angeles, California 90007, Contract No. DOT HS-5-01160" (PDF). U.S. Department of Transportation, NHTSA. ^ Hanson, Ralph (2006-06-19). 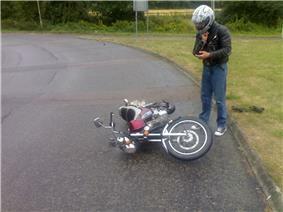 "Motorcycles are just one of life's risks: ; Still, ATGATT is undoubtedly the best policy". Charleston Daily Mail (ProQuest Newsstand database. (Document ID: 1063575001)). p. 4A. Retrieved June 6, 2009. ATGATT? That's All The Gear, All The Time - helmet, jacket, gloves and boots. And I could be badly injured riding my motorcycle tomorrow. ^ Keith, Condon (August 2009). "Gearing Up". ^ Broughton, P.S. (2005) Designing PTW training to match rider goals in Driver Behaviour and Training Vol II edited by L. Dorn. ^ "Motorcycle Headlight Modulator Regulations". webBikeWorld. Retrieved 2006-12-30. ^ "Daytime running lights for motorcycles" (PDF). ^ "IAM want compulsory ABS by 2015". ^ Thrush, Denny T. (May 2002). "Coming Soon?". 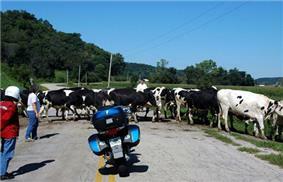 American Motorcyclist 56 (5) (American Motorcyclist Assoc). p. 30. ^ "Documents of the invention". Retrieved 26 May 2010. The second airbag device which is now available is an inflatable airbag jacket. A rider can wear an airbag jacket that is tethered to the motorcycle, so if he or she is thrown from the bike during a collision, the jacket will automatically inflate for a 20 second period to provide a cushion for the rider. This will lessen the upper body and internal injuries to a rider that may often be fatal. Mugen Denko pioneered the development of airbag jackets in 1995 and conducted many tests, although the idea of an airbag jacket / vest was invented by Tamás Straub who applied for Hungarian patent in 1976. Fuel tank mounted airbags can aid in saving many lives. It has been proven with crash test dummies that this type of airbag technology is very beneficial during a frontal collision. This is important because statistically, 62% of motorcycle accidents in the U.S. are frontal collisions. Additional tests were performed to show that when a motorcycle rider impacts a car during a frontal collision, the fuel tank mounted airbag prevents the person from traveling into the vehicle. This significantly reduced the head trauma by 83% that otherwise would have occurred according to the data from the crash test dummy. A rider would have lived with an airbag, whereas the fatality rate would be higher without the airbag. It has also been pointed out that this can only work if the accident is at low speed and follows the same dynamics as a car accident. The first motorcycle crash tests with an airbag were performed in 1973 and proved that airbag systems could be advantageous to a rider. These tests were followed up by tests in the 1990s that showed airbag devices could not fully restrain a rider when traveling more than 30 mph (48 km/h), but still reduced a rider's velocity and his or her trajectory. Honda has recently developed a fuel tank mounted airbag for the Goldwing model that takes just 0.15 seconds to deploy. Crash sensors in the front wheel send data to the airbag ECU (electronic control unit) which in turn activates the airbag inflater. The airbag then takes the force of the rider. Fuel tank mounted airbags as well as wearable jacket airbag devices have been designed to moderate the risks involved with motorcycles. Anti-lock braking system on a motorcycle was introduced by BMW in 1988 and was soon adapted by other brands. With ABS brakes, stopping the motorcycle is both easier and safer, allowing for a shorter stop range and reduced risk of skidding. The British IAM with support from the FIA has proposed that from 2015, ABS should be mandatory on all new motorcycles with a displacement larger than 125cc sold in the EU. Crash bars (also called "safety bars," or "roll bars") are common equipment on cruiser-type bikes. They are designed to protect a rider's legs (and the motor) from injury in a rollover and in a glancing contact with other vehicles. The Hurt Report concluded that crash bars are not an effective injury countermeasure; the reduction of injury to the ankle-foot is balanced by increase of injury to the thigh-upper leg, knee, and lower leg. On most new motorcycles, the headlights turn on as soon as the bike is started as a legal requirement. Some bikes have modulated headlights. This is accomplished using headlight modulators. This is still a subjective issue in some European countries. The argument is that the forced use of the headlight will lose all safety benefits if cars are also required to have their lights "hardwired." There is also an argument that the forced use of the headlight is seen as "aggressive" by other road users and so reinforces negative stereotypes of bike riders held by some. Modulators are legal in the US and Canada. It has been suggested that bright yellow front turn signals would be more practical and more effective than headlights in the daytime. According to the Hurt Report, most motorcycle riders in the USA would over-brake and skid the rear wheel and under-brake the front when greatly trying to avoid a collision. The ability to countersteer and swerve was essentially absent with many drivers. The small amount of initial countersteering input required to get the bike to lean, which is only about 0.5 seconds in average curves, makes it difficult to perceive for many. Gentle turns might require only 0.125 seconds, while sharp turns might require a whole second of countersteering at corner entry. Countersteering is used by motorcyclists to initiate a turn toward a given direction by momentarily steering counter to the desired direction ("steer left to turn right"). In Canada, the Canada Safety Council (CSC), a non-profit organization, provides motorcycle safety training courses for beginner and novice riders through its Gearing Up training program. 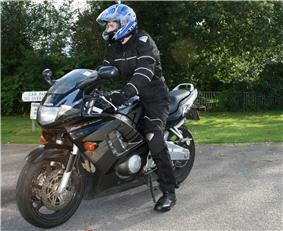 Again, as in the USA and UK, the focus is on improved rider skills to reduce accident rates. Insurance premiums may be reduced upon successful completion as this program is recognised and supported nationally by the Motorcycle and Moped Industry Council (MMIC). In the United Kingdom, for example, organizations such as the Institute of Advanced Motorists (IAM) and Royal Society for the Prevention of Accidents (RoSPA) offer advanced motorcycle rider training with the aim of reducing accident rates. There is often an added incentive to riders in the form of reduced insurance premiums. 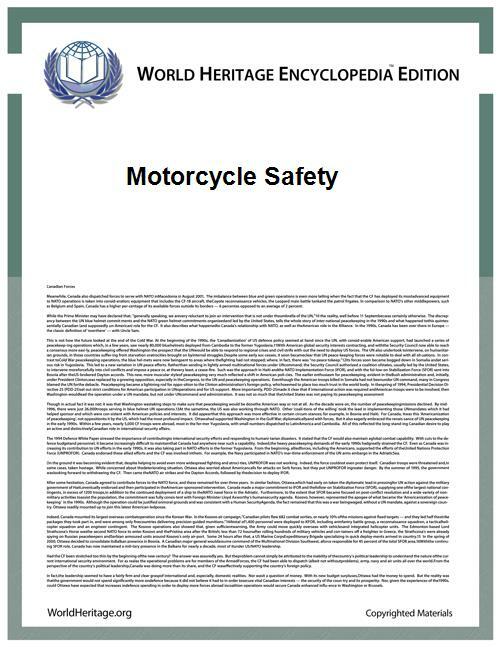 In the United States, the Motorcycle Safety Foundation (MSF) provides a standardized curriculum to the states that, in turn, provide low-cost safety training for new and current riders. Two states, Oregon and Idaho, eschew MSF's curriculum in favor of their own. With over 1,500 locations in USA, and over 120,000 annual students, MSF trains about 3% of the owners of 4,000,000 new motorcycles sold for highway use. Motorcycle injuries and fatalities among U.S. military personnel have continually risen since the early 2000s. Among other United States Department of Defense-initiated programs, the Air National Guard seeks to understand why national safety programs haven't sufficiently reduced mishaps, and how those programs might be modified to cause productive behavioral change. 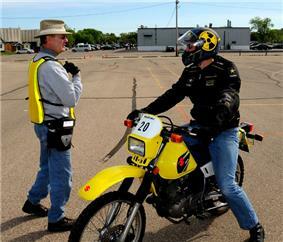 A rider receives individual coaching from an MSF instructor. Hough also said that the increase in motorcycle fatalities in the US after the year 2000 coincides with a relaxation of national rider training requirements.